When it comes to the business of the NBA — and pro sports in general — common logic would suggest that people are more likely to watch their hometown’s team if they’re winning. While this is true at times, there are several instances where this is far from the case. Since the 2017 season yielded very stale results (did anyone outside of the Bay area or Cleveland really want Round 3 of that matchup? ), NBA fans had no down time before being bombarded by a swarm of basketball news dealing with free agency, the NBA draft, and the summer league. With every single personnel change and draft pick over-analyzed to death, I wanted to dedicate a few posts to the business side of the NBA. 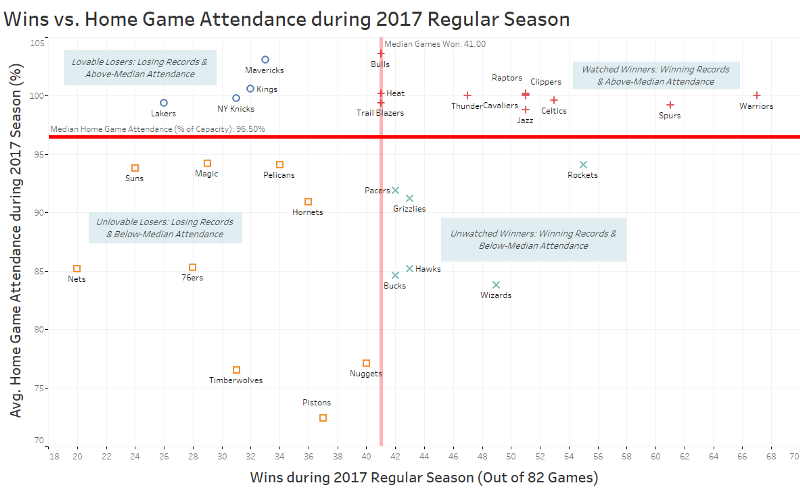 This first post will primarily focus on each team’s popularity (shown by the attendance level of home and road games) and compare this to their Win-Loss records from the 2017 NBA season. The raw data was sourced from ESPN.com, so instead of resorting to one-dimensional, surface-level stats, which all can be easily accessed from the ESPN link, I wanted to display a few insights I found to be of interest. Teams in this bracket fall within what you’d expect: teams that are winners tend to be popular. Of the 11 teams on the Watchable Winners list, the Miami Heat was the only team to miss the playoffs (and they barely missed it). Teams in this quadrant included teams from big markets (LA Clippers, Boston Celtics, and Chicago Bulls) and small markets (Utah Jazz, San Antonio Spurs, and Oklahoma City Thunder). Impressively, even after losing Durant to the Warriors, OKC still averaged a perfect 100% occupancy, no doubt thanks to Russell Westbrook’s historic season, and the fact that it’s Oklahoma City, what else is there to do there (just kidding, please don’t hurt me)? Equally unsurprising is the Unlovable Losers category. None of the teams made the playoffs, and their home towns didn’t bother showing either. However, I wouldn’t be surprised if a promising offseason will lead to quadrants moves for Joel Embiid and the 76ers as well as for Jimmy Butler and the Timberwolves. More surprising, though, are the teams that managed winning records and the crowds still didn’t show up. Headliners here include James Harden’s Houston Rockets (55 wins) and John Wall’s Washington Wizards (49 wins), both teams fell outside of the top 15 when it came to home game attendance. Wizards fans are always complaining about John Wall not getting the attention he deserves (which I fully agree with), but with an 83.8% home game occupancy, the Wizards are 27th in the entire league. Hard for the word to get out if no one’s in the building to witness it in the first place. Here’s another category that defies logic: losing teams that still managed above average home game attendance. It’s impressive in a sense that none of the teams (Sacramento Kings, Dallas Mavericks, New York Knicks, and LA Lakers) were even within sight of the playoffs but still reeled in solid attendance stats. While the Lakers and Knicks belong to massive markets, the Kings and Mavericks managed to rank in the top five among all 30 teams in the league. While the Lakers managed a 99.4% home attendance, this was still only good for last place in attendance among California teams, as well as regarding wins. 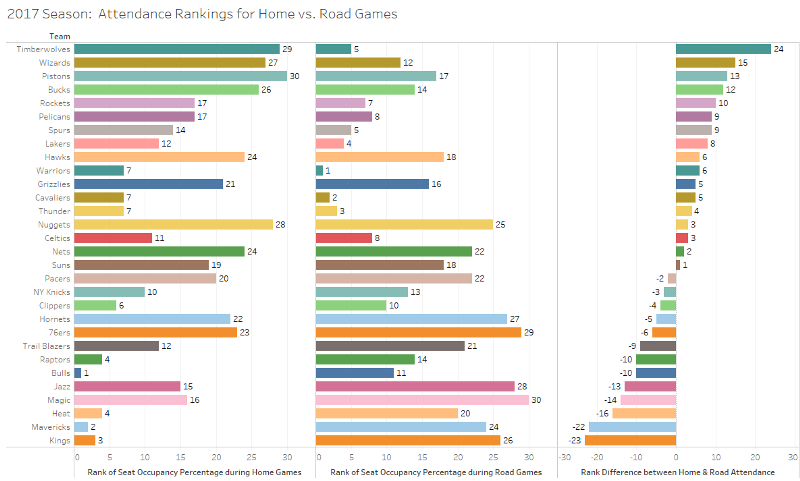 For the most part, the teams fall within 10 ranks between home and road games, but there are some major exceptions. The Minnesota Timberwolves had the second to worst home attendance (76.5%) but had the 5th best road record, which comes as a shock to me. While the young talent they boast is certainly a draw, it’s a small market team that finished another season well below .500. Next, the Washington Wizards home crowd only managed to have the 27th best home attendance despite being the home to a dynamic team. At the other extreme are the (DeMarcus Cousins-less) Sacramento Kings and the stumbling Dallas Mavericks who had home attendance ranks that crushed their road game attendance ranks by 23 and 22 spots, respectively. It’s understandable to see why opposing teams’ fans weren’t flocking to see their team play a Kings team that said goodbye to its franchise player and a Dallas team that probably made the most headlines by signing Tony Romo at the end of the year. However, it speaks a lot to the fans’ character to show up regardless. Despite having one of the better younger teams, road fans didn’t show up for the Utah Jazz (ranked 28th for road records). Unfortunately, this doesn’t look to improve any time soon with Gordon Hayward moving to Boston. If you have any comments, story ideas, or prospective data projects, please feel free to email me at dwpwriting <at> gmail <dot> com or contact me onLinkedIn.